The Band In Heaven could not have timed this album release better. 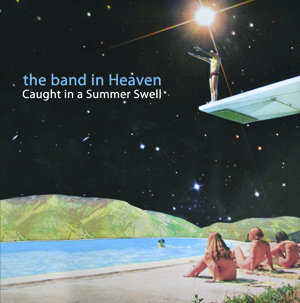 Besides serving as a solid debut LP for the Florida-based shoegaze-pop quintet, Caught In A Summer Swell is a billowing, unfeigned ode to those waning days of teenage summer. You know, the ones when the chilly breeze of fall is preparing to jolt you back out of your sloppy daze and into reality. Singer Ates Isildak funnels this melancholia through pleasant, dreamy rock like a more bummed-out Liam Gallagher — if Liam Gallagher fronted a Real Estate–Dirty Projectors hybrid. The other significant presence? Guitars. They’re coming at you from every which way on this record, chiming rhythm patterns and scraping through a low-register solo. Thankfully, the dogpiling doesn’t get too overwhelming. Occasionally, the band wanders a bit too long, as in the grungy “Young And Dumb” (nearly seven minutes in length) or any of the other tunes that cross the four-minute mark. But you can’t really ding this band for lack of conciseness when their album sounds as lifelike as this.